Laparoscopic Roux-en-Y Gastric Bypass is a reversible weight loss procedure. It involves creation of a small, 30 cc pouch from the upper stomach, accompanied by bypass of the remaining stomach. This reduces your appetite and makes you feel satiated with smaller portions. 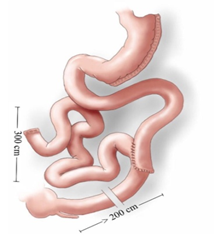 Then the small intestine is divided 60 cm from ligament of Treitz and a Biliopancreatic limb is created. A Roux limb is created using 100cm of small intestine. Reconstruction of GI tract is done to form a Roux-en-Y anastomosis.